TELL THE FDA TO STOP VACCINE INJURIES NOW! Please share this link widely, to all your circles of influence! Join the coalition of health freedom advocates who have filed a formal Citizens’ Petition under the Administrative Procedures Act (APA) demanding that FDA suspend all current vaccine drug approvals due to the failure of FDA or HHS to enforce the provisions of the 1986 vaccine safety law, including the failure to provide to Congress any of that law’s annual mandated reports on vaccine safety — thirty years of unlawfully “approved” vaccines! We’ll send you Dr. Rima’s enewsletter, information updating you on vaccine and other health freedom issues, free of charge. Your support will be posted on the Regulations.gov website comment form. Remember to assert your right to Informed Consent. If you do not, your right will be deemed waived. By Rima E. Laibow, M.D. What’s wrong with being autistic? Isn’t autism just another kind of normal? Let’s start with the question of whether autism is a profound disorder or just another way of being normal and get that out of the way right now. The people who espouse this bizarre position, hoping that autism is just like being left handed, a normal difference which should be accepted and adapted to, do not want their children – or yours! – retrieved, cured or assisted. They say autism is not an almost invariably preventable, cataclysmic and tragic consequence of largely avoidable, and always treatable, fundamentally toxic inputs, including from vaccines. Political correctness aside, I say autism IS that cataclysm and that it can, and must, be prevented and cured. GUESS WHAT? YOU ARE #1 ON THE LIST! Irrationally, WHO has cited measles “outbreaks” as “proof” that increased conscientious objections to vaccination is harmful to public health, despite scientific evidence to the contrary. Was a historic apparent ‘decrease’ in measles caused by vaccines, or despite it? Here is evidence-based science view, rather than the pro-vaxx position of pharmaceutical-supported WHO. Virtually all (over 90%) of USA measles cases have been vaccinated ‘against’ measles. Clearly, recent outbreaks have been triggered by vaccination and viral shedding. Information provided by both manufacturers and the CDC identifies measles disease as a “side effect” of measles vaccination. Another irrational and deceptive claim is that “only” live-virus vaccines can cause viral shedding and possibly infect others. There is no such thing as a “live” virus. Any shed viral particle is potential infectious. Yet another propaganda-based claim is that vaccine-spread disease is “rare.” There is clear evidence that viral shedding is a common, not a rare event, and occurs in a significant number of vaccinated persons. 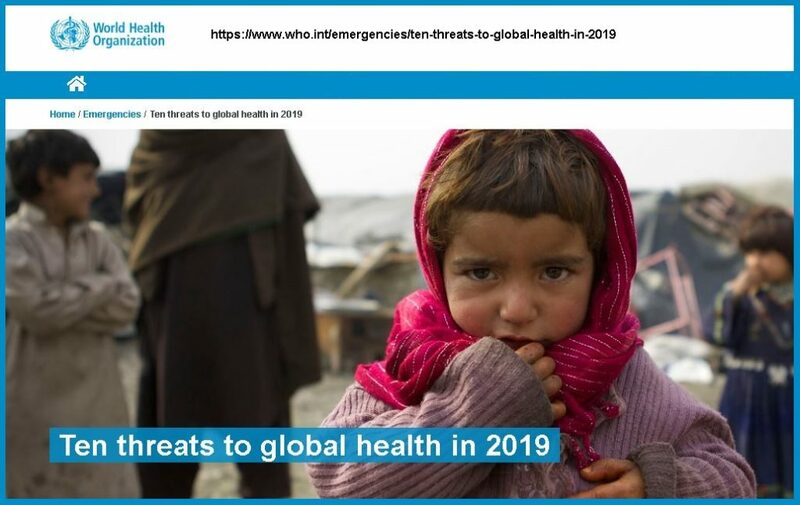 Evidence-based science demands that WHO amend its 2019 Threats to Global Health list to remove vaccine conscientious objectors and include vaccines and the dangerous people who use them instead. Since courts around the world have held vaccines to be “unavoidably unsafe”* once you are informed how can you consent? Protecting the right of Informed Consent against unscientific pro-vaxx propaganda should be the policy of every enlightened public health agency. That is what is required by the UN Bioethics Declaration. Vaccine conscientious objectors are a “threat” to the globalist agencies and crony drug companies, pushing vaccination as a public policy is bad science, violates the law and is just plain wrong. “THEY” are blocking an urgent message we have been trying to send you for the past week. The 4.5 “spam score” (privatized censorship) for that message remains so high that the email cannot be sent without further degrading the Health Freedom Email List* — significantly there is no spam in the email! This is a war and control of your body is the spoils fought over. Hint: they are creating [censored], Dr Rima is telling you what to do about it. Babies get it, kids and grownups get it. Elbows and knees and cheeks and tummies get it. Itchy, weepy, scaling, sometimes bleeding or weeping skin is a misery to live with and an indication of a deeper problem: your immune system is over excited and attacking, which is exactly what it is supposed to do. Except for one thing: it is attacking YOU, and that is exactly not what it is supposed to do. Increasing numbers of people find themselves contending with red, raw, itchy, painful and unsightly skin lesions because our immune systems are under significant assault, often from before birth. We know that genetics may play a role in this condition because if both parents have the problem, about 80% of their children will. For many of them, a mutation in the gene that controls the production of a skin-protective protein called filaggrin which helps to maintain a protective barrier on the top layer of the skin. By the way, most people use the term ‘eczema’ but the best term is “atopic dermatitis”. But the real problem is inflammation: once the immune system, with or without the filaggrin mutation, is over stimulated by chronic inflammation, it becomes unbalanced and starts attacking parts of the body by mistake. Fundamentally, we are talking about an auto immune disease or condition. Certain foods, poor beneficial bacteria populations, heavy metals (such as mercury and aluminum) and toxins in the environment and in foods can cause this kind of response. And vaccines are a prime contender for setting the stage for this, as well as other types of chronic inflammation. The treatments used by conventional Western doctors are all immune suppressive (for example, steroids) or symptom suppressive (like soothing baths or lotions) but unless the cause of the inflammation is addressed, as well as the mechanisms of the problem, it will come and go and come and come, occasionally go, then come again, endlessly in what are called ‘flare-ups’. To make matters worse, unsurprisingly, the immune and inflammation suppression drugs are really dangerous with large side effect profiles. Yet they are basically all that conventional medicine has to offer. Besides, when your symptoms get worse or you develop new conditions (like osteoporosis from the steroid use), then we give you more, and more expensive drugs. It’s the lose/win option: you lose, Big Pharma wins. Unless, of course, you choose to go another route: the solve the problem naturally, creating and maintaining health. That’s the route I like best and it’s the one that you do, too, I have no doubt. And it is the reason that I have created a new protocol to do just that with high potency, high quality nutrients available without charge for you; just email us (instructions below). All of these nutrients are available at a special price at my private dispensary, www.Wellevate.com/rima-laibow. All you have to do is decide that you are ready to work WITH you body instead of AGAINST it and follow the regimen that I suggest for you with high quality nutrients available there. Let me know how the protocol is working for you. It’s my gift to your health!